Come to Home Instead for a day of open interviews. Home Instead is a home care agency serving seniors throughout Central NH. Molly and the team will be available for open interviews and any questions regarding employment as a CAREGiver as well as service for seniors throughout the Central NH area. Come with questions and learn more about opportunities! Light refreshments will be served. Certify your leadership potential in just three two-day sessions. Get maximum impact in a manageable format. The Leadership Certificate Program acts as an accelerator for extraordinary results in your current role and an incubator for seizing future opportunities. Dr. Bill Hassey leads the certificate program with contributions from hand selected members of the Paul College faculty. Participants can expect an outstanding academic experience with instructors who have a proven track record working with the business community. The Leadership Certificate Program delivers concepts through a problem-solving framework rich in self-assessment, instruction, coaching, and practice. The tools participants take-away apply to situation after situation and role after role. Participants explore strategies for success in motivation, emotional intelligence, leading change, conflict management, coaching, and much more. Three intensive two-day sessions are spread out to allow maximum absorption, application, and renewal of concepts covered. Participation in all six days is required for certification. 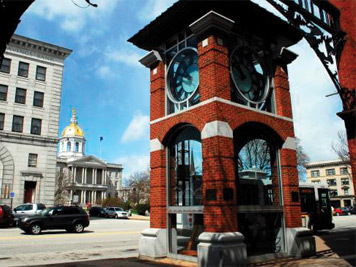 Intown Concord is pleased to present the Spring NHCIBOR (New Hampshire Commercial Investment Board of Realtors) Tour and Economic Development Presentation for Downtown Concord. Exciting changes are happening and we want to share this with you! Learn about existing investment opportunities available for your clients. Join the growing number of investors that realize the value of maintaining the economic vitality of our Main Street community. 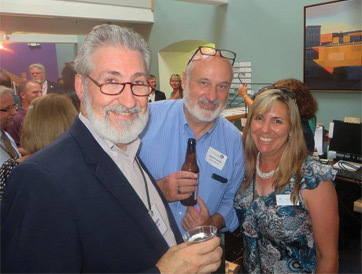 This event includes a walking tour of three up-and-coming venues, a panel discussion followed by a networking reception sponsored by Merrimack County Savings Bank. Please RSVP to Dawn Badami via email: director@intownconcord.org or call 603-226-2150. Colby-Sawyer College Singers Spring Concert "*One Voice! "* features a variety of contemporary, upbeat American music including show tunes, new compositions and spirituals. Directed by Karen Brook, the performance features student soloists and Collaborative Pianist Joe Henderson. For one weekend only, the Hatbox Theatre will host the New Hampshire Premiere of Alex Webb's beautiful and tragic Civil War love story, Amelia. An all-star cast will perform April 18 and 19th at 7:30 pm and April 20th at 2 pm and 7:30 pm. Tickets are $17, $14 for members, seniors and students and $12 for senior members. Amelia is a heroic Civil War tale of one woman's search for her husband across the battlefields of America. Disguising herself as a Union soldier, Amelia works her way south from Gettysburg following any bit of news she can find regarding her husband Ethan's, regiment. Amelia will be played by Sheree Owens while Ethan, and all the other characters she encounters, is played by Wayne Asbury. Amelia is the inaugural production of Good JoB productions, a company created by the husband and wife team of Bryan and Johanna Halperin. Bryan will also serve as director. His work may be familiar to Concord audiences as he has recently directed the award-winning Barnum as well as LOVE/SICK at Hatbox, and Once on this Island, The Hunchback of Notre Dame, and The Farnsworth Invention with the Community Players of Concord. Says Bryan, "Johanna and I couldn't think of a better play to kickoff our company than a beautiful love story about two people meant to be together but kept apart by circumstances beyond their control. It was originally written by an actor, Alex Webb, to perform with his wife, so it felt right for us to share this experience together as well. I have wanted to direct this play since I first discovered it in 2011 and have just been waiting for the right time, venue, and actors to come together." Amelia will be a tour-de-force for Owens and Asbury who have years of theatre experience between them throughout New Hampshire and beyond. According to Bryan, "Having worked with Sheree many times, I knew she was the perfect person to bring the character of Amelia to life, all we needed was the right guy to pair her with. When we met Wayne and had the two of them read the play together in our living room we knew we had found the ideal match!" A production team of experienced vets will help bring Amelia to the stage including set design by Hannah Joy Smith, lighting design by Tyler Soucy, sound design by Chuck Fray, costume design by Gay Bean, sound and projections run by Dave Peck and the production will be stage managed by Katie Griffiths. As you may know April is Child Abuse Prevention as well as Sexual Assault Awareness Month. We are writing to ask for your help in raising awareness in these two epidemics that our community faces by participating in our annual Paint the County Blue campaign on Friday April 19. You will be helping our mission supporting victims and breaking the silence as one in ten children are sexually abused, and of those, only one in ten report the abuse before the age of 18, if ever. We know how much you value working in a safe and supportive community where children and victims can heal and grow. In order to accomplish this goal, we need your help. We are looking to partner with companies in Merrimack County to remove the stigma of sexual abuse, raise awareness AND protect our community from these crimes moving forward. The Merrimack County Advocacy Center (MCAC) is based out of Concord and serves as a member of Merrimack County's multidisciplinary team alongside law enforcement, child protection and prosecution when conducting investigations of sexual assault and abuse. Out of the population MCAC serves, most are school aged children and their families. The MCAC sees an average of 300 child victims a year. Does your company have a weekly dress down day? Are staff allowed to wear jeans for a donation? Will you hang a flyer to share information about Child Abuse Prevention and Sexual Assault Awareness month? If so, please partner with the MCAC for our annual Paint the County Blue Campaign. We are asking businesses and community members to simply wear blue and/or blue jeans on Friday April 19th, display information about sexual abuse prevention and document your best blue attire by sharing your pictures to our Facebook page. You can like us on Facebook (Merrimack County Advocacy Center) then post your pictures with the hashtags; #paintthecountyblue #SAAM #NCAPM2019 and #iknowandtell. Call or email Merrimack County Advocacy Center if you would like to participate. You’re Invited to Croissants and Crossover, a partner event with the Greater Concord Chamber of Commerce and Business and Industry Association (BIA). Join us for our popular annual legislative "halftime show," Croissants and Crossover, featuring a distinguished panel of New Hampshire's finest political observers and reporters. Political intrigue, hidden agendas, outrageous controversies, key wins and painful losses from the first half of the 2019 session are all "fair game" for discussion. Discover WILD New Hampshire Day is a fun way for the whole family to explore New Hampshire's wildlife resources and legacy of outdoor traditions. Browse educational exhibits presented by environmental and conservation organizations from throughout the state. See live animals, big fish and trained falcons. Try your hand at archery, casting, fly-tying and B-B gun shooting. Watch retriever dogs in action. Get creative with hands-on craft activities for the kids. Plus, check out the latest hunting and fishing gear and gadgets. Join us from at the Grappone Conference Center for a delicious and family friendly Easter Brunch and Easter egg hunt!. A portion of the proceeds will be donated to The Friends Program right here in Concord. Tickets are $35 and $17.50 for kids 10 and under. Items from the menu include: omelet station, honey baked ham, lamb carving station, roasted mushroom risotto and a dessert bar. Ticket prices include tax and gratuity. Seatings are at 10:00 am and 12:00PM Reserve your spot today! The key to getting on track with your finances lies in your ability to STOP living in “paycheck to paycheck” mode. 70% of Americans live this way, but there is a way out. Join us for some lessons in how to take the necessary steps to building a brighter future by getting your finances and spending plan under your control. You will relieve stress and start getting ahead! There is a nominal fee to reserve your seat which will be 100% refunded when you attend the class. Non-attendance will result in the forfeiture of your seat reservation fee. Matt Osgood scribbles in to Gibson's talk about earning a living with freelance writing, as he presents Write Now! The Guide to Making It in Freelance Writing. leadership skills, which in turn foster self-confidence and personal growth. Free and Open to the Public. Door Prizes. Refreshments. Join the New Hampshire Alcohol and Drug Abuse Counselors Association (NHADACA), the leading provider of continuing education for addiction professionals in the state, on Thursday, April 25 for a fun night of cribbage at their Concord offices on 130 Pembroke Road. Doors open at 5:00 pm with play to begin at 5:30 pm; $20 per person to play, groups of 4 can play for $60. The event is limited to 40 participants; registration is encouraged. To register, email traininginstitute@nhadaca.org or call (603) 225-7060. Julie Dobrow visits Gibson's to talk about the extraordinary lives of Mabel Loomis Todd and her daughter, Millicent Todd Bingham, and the powerful literary legacy they shared in editing and publishing the first volumes of Emily Dickinson's poetry and letters, in After Emily: Two Remarkable Women and the Legacy of America's Greatest Poet. After earning national acclaim as the standout star of NBC's “America's Got Talent” and “Penn & Teller: Fool Us”, Piff The Magic Dragon continues to win over audiences across the globe with his mythical mixture of wizardry, wit and sarcasm that ignites a one-of-a-kind comedy magic show you have to see to believe!